The Ypsi Tattler | Only 5% of what is written is guaranteed to be true, it is up to you figure out which part. 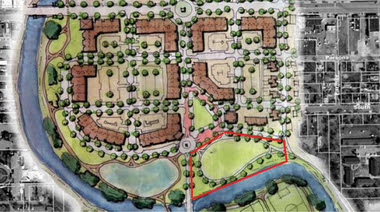 The Ypsilanti Water Street Project began in 1999 as the City of Ypsilanti accumulated properties over 38 acres between Park St. and Huron St. south of Michigan Ave. A grandiose development plan to include a housing – retail – town square was hoped for with two developers backing away from the project in both 2004 and 2006. Since only a Family Dollar Store has opened while a much-discussed recreation center and a controversial 76 unit affordable housing complex are still somewhere in the planning stages. With nothing 100% certain, the City remains receptive to realistic Water Street development overtures. Following are the latest Water Street developments as of April 1st. Retail developer Buck Szaplenti has announced signed letters of intent from the nation’s biggest discount retailers. Dollar Tree, Dollar General, the 99 Cents Stores based in California and Jack’s Dollar Store out of New York are all committed to join the already existing Family Dollar Store on Ypsilanti’s Water Street Project. Tentatively named The Washingtons Plaza, this will be the country’s first Dollar Store Mall. Watching carefully are industry experts who predict that the competition could result in prices per item dropping below 90 cents. “This is a great day for Ypsilanti”, said current City Council member and lifelong Ypsilanti Mayoral candidate Pete Murdock. – Tweeting from its St. Louis home, the World Bird Sanctuary has announced the construction of the Ypsilanti City Bird Sanctuary on the City’s Water Street Project property south of Michigan Ave. at River St.
Plans will include a walk through aviary with songbirds, hummingbirds, finches, sparrows and many other smaller species. Also, on display will be woodpeckers, storks and other birds native to Michigan in addition to live displays of bald eagles, owls, hawks, falcons, cockatoos and other exotic birds. “We’ll believe it when we see it,” said the parrots. – Exciting news for serious wine aficionados and wine – abees throughout Washtenaw County is that Ypsilanti will have its own winery and vineyards by the end of 2017. The Bella Bella (B2) Winery of Berrien Springs, Michigan has purchased the remaining 36 acres of Ypsilanti’s Water Street Project property for the development of the Chateau de’ Ypsilanti Vineyards and Winery. Thanks to a mild winter, 32 acres of red and white grape vines have already been planted in anticipation of a late summer inaugural harvest. Also to be built on the property will be a six bedroom farmhouse with a huge dining room and chef’s kitchen, furnished balconies overlooking the vineyards, a custom tasting room in the cellar and many other desirable amenities. The Chateau de’ Ypsilanti will produce primarily mid-priced white wines to include Chardonnays and Sauvignon Blanc, and reds to include Cabernets and an award-winning Sauvignon Blanc. Ypsilanti Dog Park – In dog time, it would take seven years to build. Ypsilanti City Campgrounds – A tent area, 12 cabins, a man-made lake, and a Dairy Queen right across the street. The Ypsilanti Amusement Park – Included will be the Water Street Roller Coaster, the Michigan Ave. Bumper Cars, The City Council Carousel, and the sure to be popular Water Tower Tunnel of Love. Miss Tatt has been up north all summer visiting her cousin in Tawas. Us Tattlers like to keep busy with family reunions as Tattlers from all over the country flew in. This Summer was the great chicken scandal in Tawas and Miss Tatt had a front row seat. The Tawas Tattler has been responsible for the mayor and city manager resigning, two city council members are under a threat of recall, and now the State police have stepped in with an investigation. All over some chickens in the Tattlers Coup. The big city newspaper is now pecking around with a story in the Detroit News and CNN Tattlers from Atlanta are coming up this week. You can keep up with the Tattlers ‘Cuz at the Tawas Tattler’s Facebook page. Miss Tatt is used to the late night visits from the students at EMU and the lost travelers knocking on the door asking for directions. However, the number of recent drone fly-bys is worrying. Miss Tatt needs her beauty sleep. This is the latest episode. Bob Eccles from WEMU dropped by the Tatt’s roost yesterday for a home tour. Miss Tatt enjoyed seeing Bob and thanked him for not photographing the always camera shy Miss Tatt. This is Bob’s report A Look From Inside Ypsilanti’s Historic Water Tower and here is a behind the scenes video. A tip of the beak for Ypsilanti Firefighter Rodney Schroeder for his help in rescuing my feathered friends that had fallen into a drain on East Michigan Avenue. 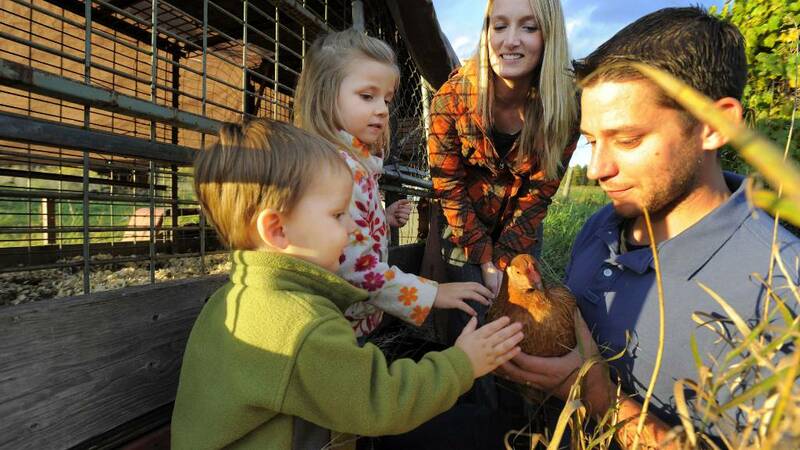 Ypsilanti firefighter Rodney Schroeder helps Miss Tatt and company save some feather friends.